I have previously written a series of articles about the study of adverse neural tension and nerve mechanics. If you are not familiar with the idea of adverse neural tension and you want to understand why somethings hurts, you should definitely give these a read. In case you didn't go back and read those old articles, here is a brief review of some basics concepts related to adverse neural tension, how it causes pain, and how to detect its presence. 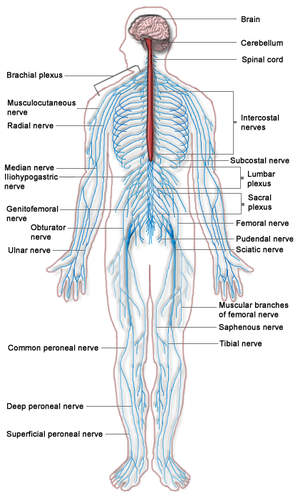 The nerves of the body cross many joints as shown in the picture to the right. As such, they need to slide, bend, elongate and withstand compression as the body moves. This motion is normal and helps keep the nerves healthy. However, many of these movements, particularly ones that elongate or compress the nerves, will restrict blood flow. This causes stress at low levels of intensity and duration, and damage at higher levels. Nerves can become sensitized to this stress under certain circumstances, such as the presence of inflammation or preexisting physical damage. In this event, normal ranges of motion can cause pain, numbness, tingling or other signs of nervy distress - this is called adverse neural tension. A great way to determine whether certain symptoms result from adverse neural tension or mechanical stress to some other structure is to use the process of "structural differentiation." This basically involves using a movement to cause some sort of pain, then moving a joint far from the area of pain to relieve tension on the nerves in the painful area (but not other structures) and see if this eases the symptoms. Here is an example you can do on yourself quite easily. Move into a forward bend to touch your toes while moving your head and neck to stare at your navel. This lengthens the continuous line of tension of the nerves from the head to the feet through the spinal cord and sciatic nerve. When you go low enough, you may feel a familiar pain at the back of the knee. Or perhaps you will feel some other undesirable symptoms elsewhere, such as the low back. To determine whether these symptoms are the result of adverse neural tension, you can release tension on the nerves in the low back and hamstring area by moving the head to look upwards while keeping the rest of the body in the same place. If this relieves symptoms at the hamstrings, the inference is that they were caused by tensioning the nerves, because these are the only structures in the knee or low back that would have been affected by the head movement. You can play with moving your head up and down to feel how releasing and increasing tension on the nerves form above affects how you feel below. You may convince yourself that these are the true "anatomy trains." With that background, let's look at the study, which tried to determine the extent to which adverse neural tension was present in 14 rugby players previously diagnosed with grade one hamstring strain. Researchers asked the players to do the slump test, which is fairly similar to the test described above. A little more than half of the players had positive tests, compared to zero players in the control group. Based on this result, it is reasonable to guess that adverse tension is likely to be present in someone previously diagnosed with hamstring strain. This leads to some interesting questions about the causative relationship between neural and muscular pathology in the case of pain in the back of the thigh. First, was there ever any actual hamstring strain in the first place? If so, was it caused by preexisting issues with neural mobility? Or did damage to the hamstring and associated inflammation and fibrosis limit neural mobility? The study was unable to answer those questions, but it does make clear that people looking to fix "hamstring" issues should consider the possibility that the real issue is with neural mobility. For some basic ideas on how to increase neural mobility, see here. Or, if you are old school and aren't interested in this new fangled neurospeak, then watch the video below for an excellent demonstration of how a dynamic warmup can increase power, athletic performance, and help prevent "pulling a hammy."